Veet shenei vanei ha asher shem ha echad Gershom: "ki amar ger ha yiti be eretz nakhriya"
"I have been an alien in a strange land:"
I khotenkha Yitro (יתרו) am come to you, and thy wife, and her two sons with her. 18:7 And Mosheh went out to meet his khoten, and did obeisance, and kissed him; and they asked each other of [their] welfare; and they came into the tent. 18:8 And Mosheh told his khoten all that YHWH (יהוה) had done to Paroh and to the Mitzrites forYisrael's sake, [and] all the travail that had come upon them by the way, and [how] YHWH (יהוה) delivered them. 18:9 And Yitro (יתרו) rejoiced for all the goodness which YHWH (יהוה) had done toYisrael, whom he had delivered out of the hand of the Mitzrites. Blessed [be] YHWH (יהוה), who has delivered you out of the hand of the Mitzrites, and out of the hand of Paroh, who has delivered the people from under the hand of the Mitzrites. 18:11 Now I know that YHWH (יהוה) [is] greater than all gods: for in the thing wherein they dealt proudly [he was] above them. 18:12 And Yitro (יתרו), Mosheh khoten (father-in-law), took a burnt offering and sacrifices for Elohim: and Aharon came, and all the ziknei Yisrael, to eat lechem with Mosheh khoten (father-in-law) before Elohim. 18:13(ii) And it came to pass on the next day, that Mosheh sat to shofat the people: and the people stood by Mosheh from the morning to the evening. What [is] this thing that you doest to the people? Why sittest you yourself alone, and all the people stand by you from morning to even? 18:16 When they have a matter, they come to me; and I shofat between one and another, and I do make [them] know the statutes of Elohim, and his Torah. 18:17 And Mosheh khoten (father-in-law) said to him, The thing that you doest [is] not good..
18:18 Both you and these people who are with you will surely wear yourselves out. For this thing is too much for you, you are not able to perform it by yourself. 18:20 And you shall teach them ordinances and Torah, and shall shew them the way wherein they must halak, and the work that they must do. 18:22 And let them shofat the people at all seasons: and it shall be, [that] every great matter they shall bring to you, but every small matter they shall shofat: so shall it be easier for yourself, and they shall bear [the burden] with you. 18:23 If you shall do this thing, and Elohim command you [so], then you shall be able to endure, and all this people shall also go to their place in peace. 18:24 (iii) So Mosheh listened to the voice of his khoten, and did all that he had said. 18:25 And Mosheh chose able men out of all Yisrael, and made them heads over the people, rulers of thousands, rulers of hundreds, rulers of fifties, and rulers of tens. 18:26 And they shofat the people at all seasons: the hard causes they brought to Mosheh, but every small matter they shofat themselves. 18:27 And Mosheh let his khoten depart; and he went his way into his own land. Yitro and his community according to commentary of the Artscroll Chumah explains that Yitro had once been a distinguished personality - minister of Midyan and former adviser to Paroh, throughout the chapter Yitro was received royally, not only by Moshe but also by the entire Yisrael nation and he later justified the honor by offering counsel on how to organize the nation's judicial system in vs 13-23. In recognition of that service, Yitro was given the name Yether, When he converted to Judaism the letter vav was added to his name which was changed from Yether to Yithro were known to be a mixed multitude united as one nation, Hashem desire to create a unified faith. In this chapter we can see Hashem teach Yisrael three important lessons. Prepareness, reliance and revelation. 1st stage Unified faith, One people - preparation one accordance be ready - disunity is devasting. 1. like-minded believer willing to share responsibilities working together one accord. 3rd Stage Revelation - reality allows the entire community too receive knowledge of Hashem shemot 20:21-22; more than one individuals to prevent deception and make deception more difficult. Midbar (wilderness, מדבר) - Desert: The word desert is מדבר midbar translate as wilderness. The Desert of Sinai peninsula in which I visited in June 2008, was a barren places lacking in water and vegetation; places inhospitable for the presence of man. In the desert there are many fiery deadly poisonous snakes and scorpions. The word midbar contains the Hebrew root word dabar meaning "word". Desert is the place of the word, the place of revelation. The desert is the opposite of Egypt which I have visited is a the place of worldliness, greenery watered by the nile, prosperity, Pride, heroic architecture and there. many idol scuptures. In the desert benai Yisrael had to dependent of Hashem for food and water. 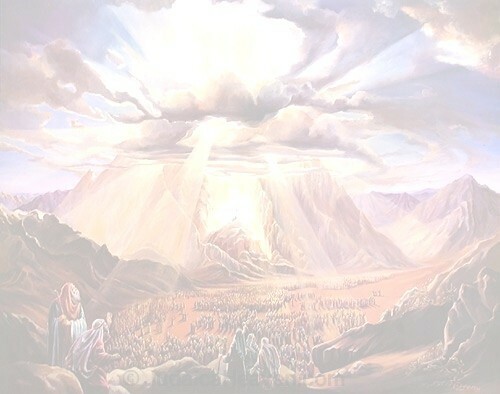 It is also in the desert Yisrael encounters Hashem's faithfulness. It is to a believer that the desert is a spiritual journey that we have to meet with trials , disciplines, separate ourselve the old ways prepare our clean heart before Hashem.